Yakutia-based regional and charter airline Alrosa (controlled by state-owned Alrosa mining enterprise) is looking for aircraft to replace its Tupolev Tu-154Ms in 2017-2018. Two of the Soviet-built aircraft are still flying, but the carrier is considering SSJ100LR, the long range version of Sukhoi Superjet, for replacement, Alrosa’s general director Andrey Gulov told Russian Aviation Insider. “Since [the government] made the decision to top-up the capital of the leasing companies, they have finally come up with viable offers (not the appalling rigorous conditions that are in practice today) in terms of leasing rates and terms, as well as aircraft support, spare part pools and residual value guarantees. So now we will take the SSJ 100 purchase issue to the board. We’d like that to happen before the year-end, or early in 2016,” Gulov said. Alrosa has already adjusted its network to the SSJ 100. However, the carrier’s top-manager noted, that “the SSJ 100LR is no replacement for Boeing aircraft”. Alrosa is operating three leased Boeing 737-800s, which entered its fleet as a planned replacement for the obsolete Tu-154s. 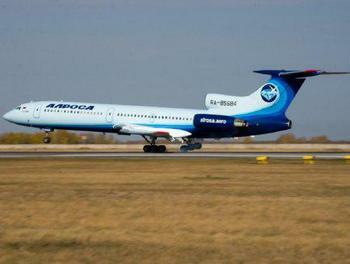 All three aircraft are painted in Alrosa’s schemes. According to Federal Air Transport Agency’s June data, there were nine Tu-154s in Alrosa’s fleet. Two more aircraft of this almost extinct type are registered with Gazprom Avia, one – in Cosmos airline and four with Defense Ministry. From January to August 2015 Alrosa serves 231,000 passengers, with YOY growth of 31%. It now occupies 27th line by traffic in Russian airline rating.